The first cross bay sail of 2018 took place just after the last Committee meeting. Simons B & E and Joanna set sail in ‘Raindance’ and ‘Jamila’. 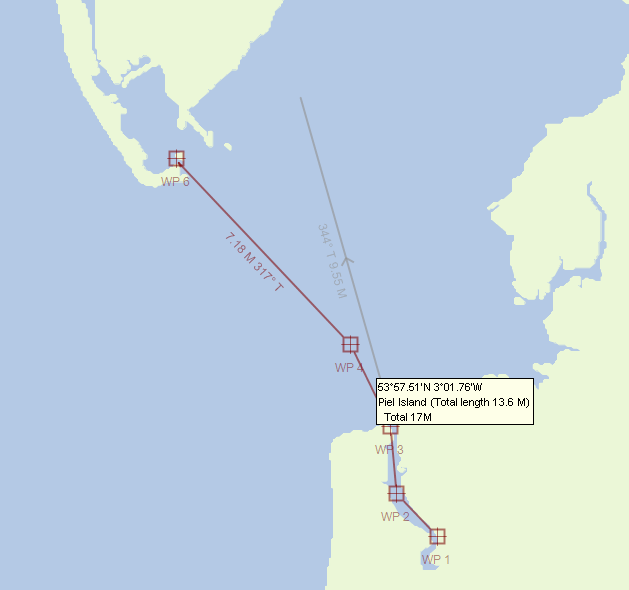 Just to remind you where Piel is :), I’ve inserted a rough chart showing the route. The course to steer as shown is set for a spring tide weekend thus we probably steered somewhere between the two headings shown. All was a little hurried! Simon E’s plan, as it was the night before, had been limited to doing some post launch jobs on ‘Jamila’. There was a little list of things to do. The mooring chain needed attention, the VHF aerial needed bending back following the launching mishap with the crane, and the sails hadn’t been properly readied for the new season. Simon B and Jo, on the other hand had already done a shakedown sail having come down from MaryPort just the week before. Now single handed sailing out at sea is always a daunting prospect particularly when the skies are grey and the wind is whistling through the sails and rigging. Finding the courage to drop the mooring and to allow the boat to drift way with the ebbing tide requires thorough preparation, check lists with lots of ticks, so that every big and minor detail is just so! Still I wasn’t to be alone, I had the experienced Skipper Simon B and Joanna (Jo has recently become a ‘RYA Day Skipper’ ticket holder.). Yes, I would be tagging along. I could do some of the jobs like bending on the genoa, putting in the slab reefs whilst under-way and fixing aerials. The ‘Simrad’ tiller pilot would definitely help out. As you can see in the image there was preciously little wind and the visibility was down to only a couple of miles. A jenoa is large head-sail and bending it on to a roller-reef spar isn’t normally a problem with two pairs of hands, however today it proved very difficult with only one. The bolt rope in the luff kept jamming. I had to winch a little, run forward to align, run back, winch a little more, then run forward to re-align and so on. Tiring work, but slowly the sail worked itself up the mast. And, it must be added, all the time having to keep a lookout to avoid an untimely collision with the shore. Then all movement of the jenoa stopped dead! I tried to winched harder, and then harder still, then Bang! Something broke. Then I saw it. The cable from my chart-plotter was caught around the winch. Now chart-plotters are great, anyone can navigate to perfection. Well, I exaggerate a bit, but you always know where you are , you can see where you need to go, and you can avoid collisions with rocks and other obstacles. As soon as the sail was up, I dropped down into the cabin to root out my Garmin GPS from its locker. Damn, the batteries were dead! Where are the spares? Couldn’t find them! At this point I was following ‘Raindance’ out to sea, heading for the Fairway buoy, and you guessed it, the visibility was down to just a couple of miles. After about twenty minutes I could just and so see the Heysham Nuclear power station’s vast ‘white clad’ bulk but not much else! Right, time to do some proper navigation. I’ve got my Coastal Skipper’s ticket, so time to cash in the investment! With an old dodgy looking hand held compass I took the two available bearings. Plotted my current position. Counted the minutes until the Fairway buoy started to fade then plotted a second position, and finally calculated a true bearing to take me over the banks into the barrow channel. Poor Simon B and Joanna could not work out what on earth I was doing, … thought I’d gone a bit daft! We travelled together for a while, but suddenly I looked over and noticed ‘Raindance’ was nearly a mile to starboard. Soon I found out why. Out of the gloom on the starboard bow a dark blot started to materialise. It was Piel Castle, which should have materialised much further to the port had my ‘old fashion style’ estimations and calculations been better! I was much too far down tide, and alas I would have to start the engine and work it hard, using up precious diesel oil, to get to safety. Simon B and Joanna arrived first in ‘Raindance’. There was one other boat in the harbour, but now there were three. It was several years ago in April when the crew of ‘Alcudia’, a lovely red Cobra 750, moored up for the night at Piel. It was just after the crane-in. The skipper picked a robust looking buoy and pulled the mooring line from the buoy safely up onto ‘Alcudia’s big bow cleat. The following morning after what must have been a blissful sleep ‘Alcudia’s crew, who happened to be the same Simon B and Jo, were woken from their dreams by the sound of plates and cutlery crashing into cabin sole. In the night the boat had parted company from the buoy and had gently drifted with the tide up beyond Roe Island and had settled at a precarious angle up a little mud creek. In 2018, however, there was to be no mistake. The buoy’s mooring lines looked a bit old and muddy with colonies of marine life growing on the end adjoining the buoy obscuring inspection! Instead, a nice new pristine length of rope was pulled from ‘Raindance’s locker and made fast, such that there would be no mistake this time around. Simon E on ‘Jamila’ grabbed a buoy nearby. Having had only happy times moored off Piel Island, he was only too happy to trust the equally muddy looking strops in order to get on with packing away the sails and to eventually paddle the short distance over to ‘Raindance’ for a planned barbecue on board ship. The above photograph was taken en-route in the Avon dinghy. The Ship Inn was closed that night. Not a lot going on this clip, or was there? As it happened, a thunder storm passed by just beyond Piel Castle. We saw quite a number of lightning strikes. Some were the classic bolts you see in the horror movies, and some were like the one caught on this clip at the 8 second mark. All were followed by deafening thunder claps that had the three Wardley’s sailors laughing unconvincingly at each other. Our sudden bout of gallows humour eventually died away as the storm moved on further up the Cumbrian coast. Still, fair-do’s to our innate sense of self preservation, we did have the tallest lighting conductor in the harbour right over our heads! Simon E was not as well organised as the crew of ‘Raindance’ in terms of ships victuals and needed the help of the Piel Ferry to get back to ‘Jamila’ after breakfasting ashore. Now, the barbecue aboard ‘Raindance’ the night before this photograph was a resounding success. Joanna had done an ace job ‘literally’ running around the finest charcuterie shops and boutique butchers that Fleetwood town had to offer. The food was excellent and the finest wines were served ‘grace au’ skipper de ‘Jamila’. And not forgetting Simon B’s story telling that had us riveted with his daring-do on tall ships in various far flung places. The morning was grey and overcast. Simon E paddled the short distance to the Ship Inn. Landlady ‘Shelia’ was behind the bar, and three lads who appeared to be in there late teens were busily warming themselves by the fire. The trio had camped the night on the island but the plan went awry when they discovered the pub was shut, and so no beer to drink, and, as well as tents, you need sleeping bags to go camping! Sheila and Nicola (ex army medic) were going their best to cheer them up with anecdotes of how much colder it was in Norway and that only the hardest of soldiery could put up with it. A big breakfast was ordered. Eventually King Steven walked in with a large plate of eggs, bacon, sausages and all the trimmings. After placing down the plate he plonked himself down on a nearby seat and we both exchanged news and views about what had happened on the ‘Furness peninsula Islands’ and ‘Wardleys Marine YC’ during half year just gone. Eventually it was time to say farewell. On the way down to the Avon round-tail dinghy, the Piel Ferry was alighting two day trippers . We passed on the narrow jetty exchanging friendly nods. The Skipper and crew of the ferry stood waiting for me. I pointed at my dinghy but they smiled knowingly whilst looking down at the Avon, and opened a conversation informing me that the tide would be flooding rapidly by now and that I just might want a tow. I gratefully accepted. They refused any donations for their services and posed for the above photo before heading back to Roe Island. The radio then crackled into life. ‘Raindance’ to ‘Jamila’ over! A brief discussion ensued. Simon B recommended a single reef in the mainsail would suit the force 4 gusting 5 that was by now blowing, and very soon we both had most of our white canvas high aloft, bellowing in the wind, for the sail back home. ‘Jamila’ was the first to cast off. The ferrymen were quite right. The tide had turned and was to prove a little too much for canvas alone. ‘Jamila’s Volvo-Penta was bought into play to maintain a steady 4/5 knots of speed on what was basically a close hauled beat up the Barrow channel. The Simrad autopilot’s self tacking mode made easy going of it at a time when there was no room for error given the fact that the hidden Sel-dom-Se-en reef was just off the starboard marker. The self-tacking goes like this: with the Sel-dom-Se-en green marker quickly approaching at about fifty yards to port, you press the autopilot’s red ‘tack’ button and immediately press the right arrow button. the Autopilot starts to bleep loudly. The crew then must quickly prepare for the tack, loading the winches and untangling sheets etc. Suddenly the beeping turns into a long continuous bleep and the tiller is automatically pushed hard over to the lee. Next the crew must release the sheets to port, awaits the bow to pass the eye of the wind, and then sheet in to starboard. By the time one finds the time to look up, the tiller has centred itself, and the boat is heading on the next tack – in this case towards the lighthouse on Walney Island. Still a little behind, ‘Raindance’ was slowly catching up. She’s a much longer boat than ‘Jamila’ and the extra waterline length demonstrated the extra displacement speed she had available. By the time the castle was becoming a small feature in the distance, she was right up behind, both crew members were beaming a broad smile from behind the large spray hood. In a last ditch attempt to stay in the lead ‘Jamila’ released the full extent of her large Jenoa in the hope of scraping a few extra fractions of a knot, but nothing could stop the approaching ‘Raindance’. Very soon she was sailing along side, with her bows crashing deeply into the on coming chop. Once the two two boats were side by side, cameras were pulled out from their protective pouches and pictures taken. Above are example taken from both boats. ‘Raindance’ pulled ahead and both boats entered the choppy waters of mid Morecambe Bay. 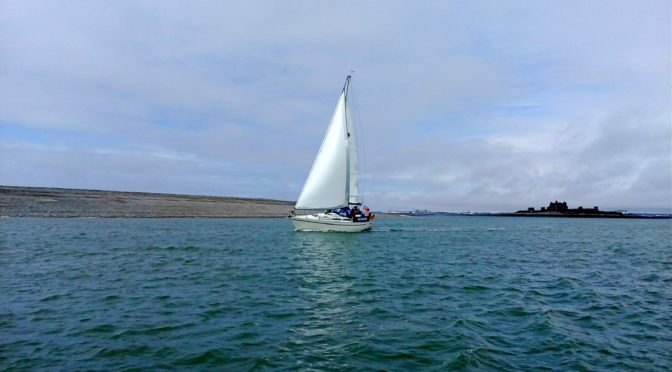 The wind was favourable and provided sufficient speed over water to beat the flood tide, which at this point was pouring into the said bay at a rate of two knots. Time seemed to go fast at this stage. Soon the remnants of the Fleetwood Tower, marking the start of the channel-approaches hove into view. Both boats passed the Fairway north cardinal buoy and joined forces with the tide reaching speeds over-ground close to 7/8 knots, up the channel into Feetwood. At this point the boats parted company. ‘Raindance’ made for the marina at Fleetwood and ‘Jamila’ made a solitary trip up the River Wyre, under sail all the way, and was soon safely back at her mooring. That’s all folks, the end of another great sail by three Wardley’s Marine Yacht Club members.